These are lyrics by Platinum Blonde that we think are kind of nonsensical. 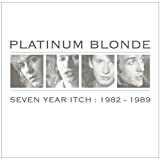 Platinum Blonde's, "Cast A Shadow"
A set of wheels won't get me very far. From the 1983 album "Standing In The Dark." It's just one of those lines that makes you go WTF? Platinum Blonde's, "Crying Over You"
Amazing; in the nearly 29 years (as of 2013) I knew about this song, I still don't know what that verse means? Platinum Blonde's, "Not In Love"
It can't be your house if "no one lives there anymore", which is a fallacy if it's your house. Platinum Blonde's, "Standing In The Dark"
This makes no sense. How can you run and hide after you've committed suicide? That whole song is nonsensical. If you don't know which way is up after walking in circles destined to collide then you really must be crazy. I'm not quite sure what one of these verses has to do with the other?